One of our many resolutions this year as an agency is to provide our ever-growing roster of clients with better support, client servicing and access to data to will help you dissect and understand your marketing campaigns better. We’re therefore proud to announce the launch of the “My Unity Online” client portal that accomplishes the above – and a whole lot more. What is “My Unity Online”? Gone are the days of receiving your marketing reports from a freelancer in a haphazard email or from an agency in a link that only snapshots the overview. At Unity Online, we have opted to create a mini-universe for you, where you can simply sign-in to a portal that does a lot more than offer a pretty picture of your marketing investment. “My Unity Online” has been designed by our development team to provide you with downloadable data, a historic archive of your marketing reports, monthly highlights of your marketing campaigns and an extended platform to start new conversations with our client experience team. Our Head of Development, Robert Moore explains that whilst the development of a client portal was easy for our team of developers at Unity Online, “the most important part of the portal is the security” of our clients’ sensitive marketing data. That’s why our clients will be receiving their own logins with a primary username to access marketing information easily and securely. Once logged in, you will be taken to a dashboard overview of the services your business has signed up for. 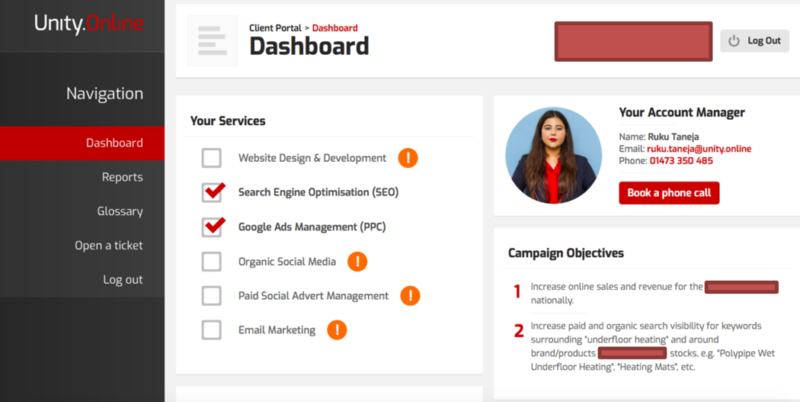 The dashboard also lists the additional services you could potentially explore, as well as your campaign objectives that the Unity Online team is working towards. There is also a clearly defined account manager for each client, displaying their contact details and functionality to book a scheduled phone call with. Having a single point of contact helps to filter your requests through the agency for a prompt response from someone who is familiar with the activity of your marketing campaigns. Scrolling below on the dashboard, you can see the “Monthly Highlights” snapshot of each marketing campaign. 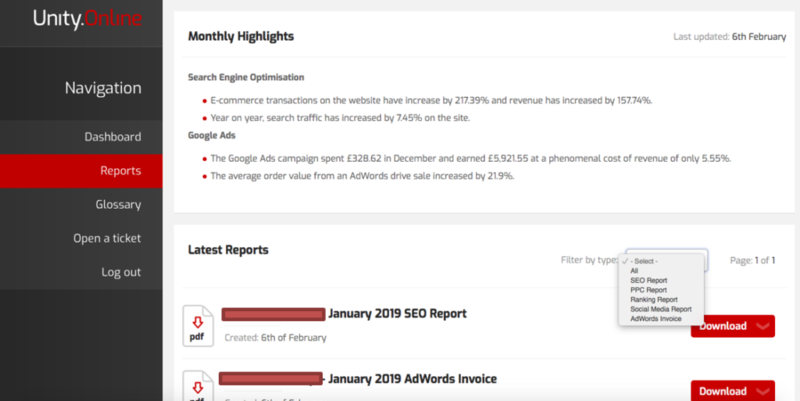 In this example, it looks like the search engine optimisation for this client has led to a 217.39% increase in transactions and a 157.74% increase in revenue in January. Wow! These are brilliant statistics that you or your marketing team can now easily access and report back to your board of directors. Speaking of easy access, the latest reports for each marketing campaign are available for PDF download within this section of the dashboard, too. Head to the “Reports” tab on the left-hand navigation and you will be able to find the historic marketing reports dating back to your first day working with Unity Online’s digital experts. The reports can be filtered by service to help you scroll through them more efficiently. If your monthly reports contain any digital marketing terms that you or your marketing team are unaware of, the glossary in the navigation of the portal is an additional source of information that explains the language we work in. We don’t expect all our clients to know that a 301 redirect means a permanent server redirect. 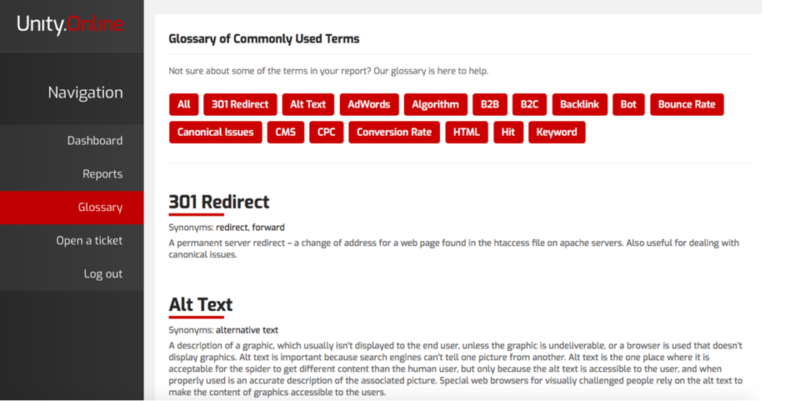 That’s why this regularly-updated glossary should be your first port of call before reading your next monthly report. Another primary feature of the “My Unity Online” client portal is the “Open a ticket” system. This allows you to directly report any technical issues regarding your website or marketing campaign(s) that need to be looked into. Once you submit a ticket, your preferred method of communication (phone or email) and the related product issue (e.g. web development), the portal directly notifies the relevant team members for that service. This allows us to investigate promptly, whilst filing a case for the team to review in their daily internal meetings with priority. What’s the verdict? Are you loving the new “My Unity Online” client portal as much as us? As an agency, Unity Online strives to provide client-centric service, paying significant attention to all client feedback. By listening to our clients, we are continually improving the client experience of all our digital services. Innovations such as “My Unity Online” are founded upon client feedback, helping them to interpret and keep abreast of the amazing marketing results our team of digital marketing experts are capable of. 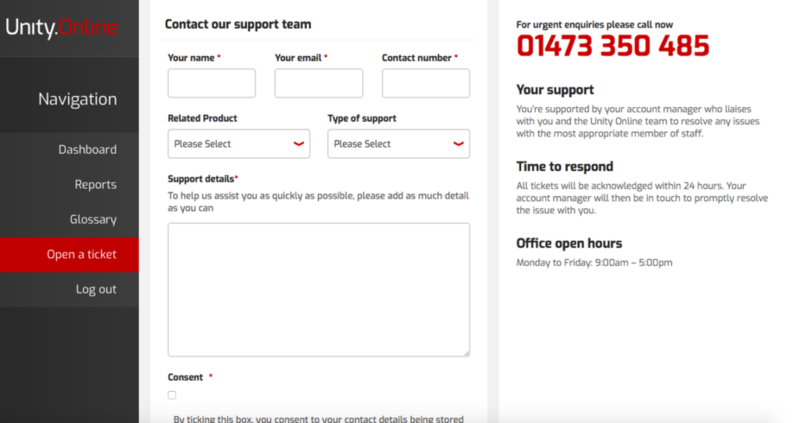 If you’re keen to understand how Unity Online’s fast-growing team of digital experts can grow your business with data-driven digital marketing campaigns, arrange a free initial consultation today and start taking a different digital path with Unity Online. How Is Social Media Impacting Your ROI?